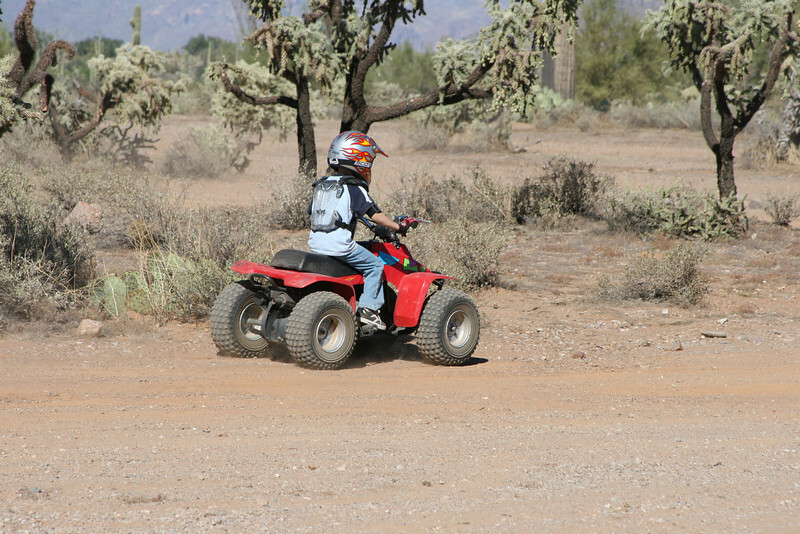 We went out camping and riding in the Martinez area 10-31 to 11-02-08. We had a blast. Our grandkids Ashlea and Tyler came with us along with Art & Jeneen, Jim & Susie with their grandkids, Ken and Nancy, and Robert and his son. We even had a surprise visit on Saturday from Johnny and Dana. The weather was near perfect and the sunsets amazing as always. This area is great got the kids to ride as it is flat except for the wash and lots of room for the kids to ride and play. We were taking a break when Danny came over and said Tyler’s quad was stuck, so I jumped on a quad and headed off to see where he was stuck. Tyler was walking up from the wash so I put him on the quad and said where are you stuck? He showed me and as we came up to his quad it was on its side. I said you know what we have to do now don’t you. No he said. I said we have to go get the camera. He wasn’t hurt just a tip over which was a good thing to make him realize it is not all fun and games; you can get hurt if you aren’t paying attention. On Saturday a few of us went on a ride through Box Canyon over to the derision dam to play on the sand hills. After that we went towards the cabins and took the trail over the tops of the mountains back home. Sunday we went for a short exploratory ride over by a trail called Elvis. What a blast to be able to get away with good friends.